Perinatal depression is a public health priority associated with high prevalence and poor child development. In High Income Countries (HIC), the value of total lifetime costs of perinatal depression has been estimated to be over US$ 100,000 per woman with the condition, with the majority of the costs related to adverse impacts on children.1 In Low Income Countries (LIC) where perinatal depression affects 1 in 5 women, and unlike HIC, is independently associated with infant undernutrition, the relative impact is likely to be greater. 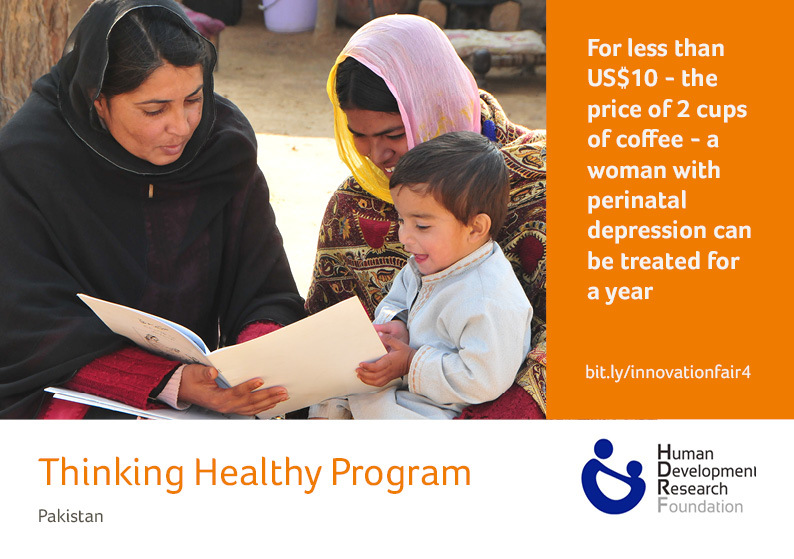 The Thinking Healthy Programme (THP) aimed to reduce perinatal depression in low socioeconomic settings and to improve health outcomes in their children through the adaptation and integration of Cognitive Behavior Therapy (CBT) into the routine work of community health workers. Starting from pregnancy till one year postnatal, participants received 16 sessions of the evidence based “talking therapy”. The sessions combined the therapy with activities to improve maternal well-being, mother-infant interaction and maternal social support. The intervention has been evaluated in one of the largest randomized trial for psychological interventions to be conducted in the developing world. In a rural Pakistani population of 1.2 million, about 4000 pregnant women were screened to identify 903 with perinatal depression. In partnership with the Primary Health Care Services, 42 Community Health Workers were trained to deliver THP. The intervention cost under US$ 10 per woman per year, and led to recovery in 3 out of every 4 woman treated. "Thinking Healthy Programme has been tried successfully in various settings across South Asia and has been adopted by the World Health Organization for global dissemination. The stage is set for all stakeholders to assist with the scale-up of this intervention to reduce the suffering of millions of women across the world. " The Thinking Healthy Programme (THP) is a manualized intervention that can be incorporated into the routine work of community health workers. It incorporates cognitive and behavioral techniques such as active listening, collaboration with the family and non-threatening inquiry into the family’s health beliefs; this is achieved through challenging beliefs and if necessary offering substitutes for some of these through alternative information. Starting from pregnancy till one year postnatal, participants received 16 sessions of the evidence based “talking therapy”. The sessions combined the therapy with activities to improve maternal well-being, mother-infant interaction and maternal social support. It also uses inter-session practice activities. It is designed to be integrated into existing maternal and child health education home visits. The training for community or lay-health workers is brief (5-7 days) and can be conducted by non-specialists with some experience of using THP in their work. A cascade model of supervision and monitoring has been developed whereby a specialist supervises a number of non-specialist trainers via skype, and the non-specialist trainers cascade this training to the lay-health workers. We have developed an application for delivering training through a tablet device to assist in the scale-up of THP and its use in areas where normal training is hard to conduct, such as those affected by a humanitarian crisis. (See innovation Thinking Healthy Programme – Technology Assisted). Through Grand Challenges Canada support, we have developed and are testing a technology assisted tablet-based application (THP-TA) through which training can be delivered by a non-specialist with minimal experience of mental health. Through National Institute of Mental Health support, we have developed Thinking Healthy Programme – Peer-delivered (THPP). Through Grand Challenges Canada support, we have developed a simple interactive voice response system that allows women to use a free-phone number where a rapid automatic assessment using two questions can allow them to be screened for further assessment or treatment. (See innovation Thinking Healthy Programme – Technology Assisted). Solution: With Wellcome Trust support, we have developed a simplified version of THP for all women at high-risk of depression and living in poor conditions (Thinking Healthy Programme – Universal), which can be incorporated into any programme after 1.5 days of additional training. Thinking Healthy Programme has been implemented successfully in three sites across South Asia (Pakistan (including Karachi), India, Bangladesh), and in Vietnam, Nigeria and Bolivia. It has been adopted by the World Health Organization as part of their flagship mental health GAP action programme. The intervention has been adapted for delivery in various formats such as with technology, through peers, and integrated into universal maternal and child health programmes. The intervention was evaluated in what is, to date, the largest cluster randomised controlled trial of a psychological intervention for perinatal depression in the developing world. The intervention has also been tried in India, Bangladesh, urban Pakistan (Karachi), Vietnam, Nigeria and Bolivia. Cost analysis has not been conducted but the treatment cost is less than USD $10 per woman when the cascaded model of training and supervision is used. In a population of 1.2 million, approximately 4000 pregnant women were screened to identify 903 with perinatal depression. In partnership with the Primary Health Care Services, 42 Community Health Workers were trained to deliver THP. Half received THP and the remaining Enhanced Usual Care (EUC), consisting of an equal number of supportive and health education sessions by community health workers. THP was superior to enhanced usual care by 30%, leading to recovery in the most severely depressed mothers and improved health of their infants. The women remained well a year after treatment. Bauer A, Knapp M, Parsonage M. (2016) Lifetime costs of perinatal anxiety and depression. Journal of Affective Disorders. Journal of Affective Disorders, 192:83–90. Rahman A, Surkan PJ, Claudina E. Cayetano CE, Rwagatare P, Dickson KE. (2013) Grand Challenges: Integrating Maternal Mental Health into Maternal and Child Health Programmes. PLoS Med.10(5):e1001442. Rahman A, Malik A, Sikander S, Roberts C, Creed F. (2008) Cognitive Behaviour Therapy-based intervention by community health-workers for depressed mothers and their infants in rural Pakistan: cluster-randomized controlled trial. Lancet, 372:902-909.